Tripoli: UN Secretary-General Antonio Guterres was flying to eastern Libya on Friday to meet commander Khalifa Haftar, whose forces are advancing on the capital Tripoli now held by an internationally-recognised government. Troops allied to the Tripoli government moved more vehicles from the western city of Misrata to Tripoli to defend the capital against Haftar’s forces, who are allied to a parallel administraion in the east, residents said. The advances by the Benghazi-based eastern forces marked a dramatic escalation of a power struggle that has dragged on in Libya since the overthrow of Muammar Gaddafi in 2011. They also surprised the United Nations, whose Secretary-General Antonio Guterres had been in Tripoli this week to help organise a reconciliation national conference later this month. Guterres, who spent the night in the heavily fortified UN compound in a Tripoli suburb, will also go to Tobruk, another eastern city, to meet lawmakers of the House of Representatives, also allied to Haftar. “My aim remains the same: avoid a military confrontation. I reiterate that there is no military solution for the Libyan crisis, only a political one,” Guterres wrote on Twitter. Late on Thursday, the assembly president, Aguila Saleh, issued a statement welcoming the offensive, a spokesman said. Since Gaddafi’s downfall, the country has been divided between the UN-backed government in Tripoli and the parallel administration allied to Haftar. 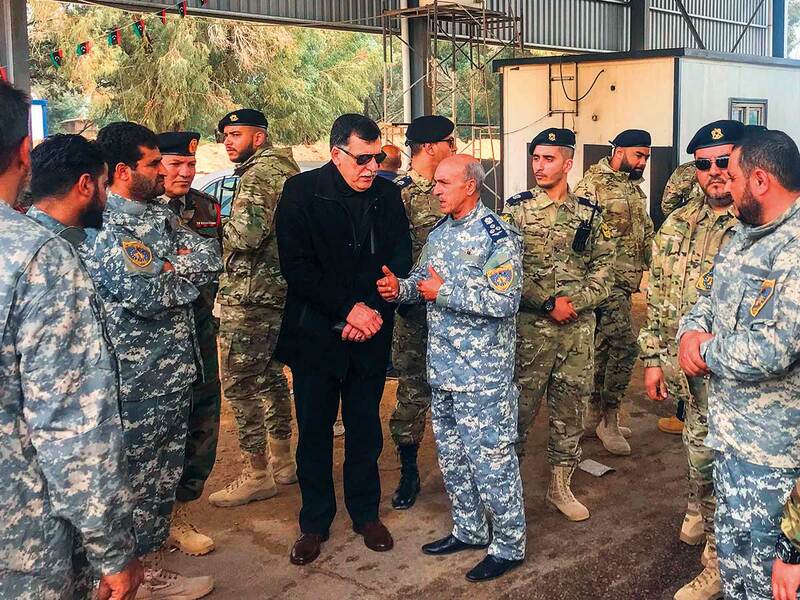 Haftar’s Libyan National Army (LNA) forces on Thursday took Gharyan, a city some 80 km south of Tripoli after brief skirmishes with forces allied to Tripoli-based Prime Minister Fayez Al Serraj. But the LNA did not succeed in taking a checkpoint west of the capital in a bid to close the coastal road to Tunisia, Tripoli’s main artery. An armed group allied to the LNA withdrew overnight from the so-called Gate 27, 27 km west of Tripoli, which was abandoned in the morning, a Reuters reporter said. The renwed confrontation is a setback for the United Nations and Western countries which have been trying to mediate between Serraj and Haftar, who met in Abu Dhabi last month to discuss a power-sharing deal. The conference the United Nations is helping to organise is aimed at forging agreement on a road map for elections to resolve the prolonged instability in Libya, an oil producer and a hub for refugees and migrants trekking across the Sahara in the hope of reaching Europe. Haftar’s biggest opponent is Misrata, a western city that is home to strong forces which also have aircraft, analysts say. It is known for resisting old regime figures, including in 2011 when forces loyal to Gaddafi besieged it for three months. What is Egypt’s referendum all about?